Jane Austen’s World and Regency Ramble both give comprehensive discussions on dogs of the early nineteenth century. In this post, however, I would like to draw attention to the changing nature of how persons viewed their dogs during the Regency. Of course one valued his canine friend for his practical traits which aided such pursuits like hunting. But the dog was also becoming prized for those qualities that were lauded in the romantic literature of the period–noble characteristics that were always evident in Man’s best friend, but never appreciated fully until now: bravery, loyalty, humility, etc. Byron wrote a poem eulogizing his own Newfoundland, which had contracted rabies and died in 1808. The poet nursed his dog throughout the illness, never minding that he himself might contract the disease. 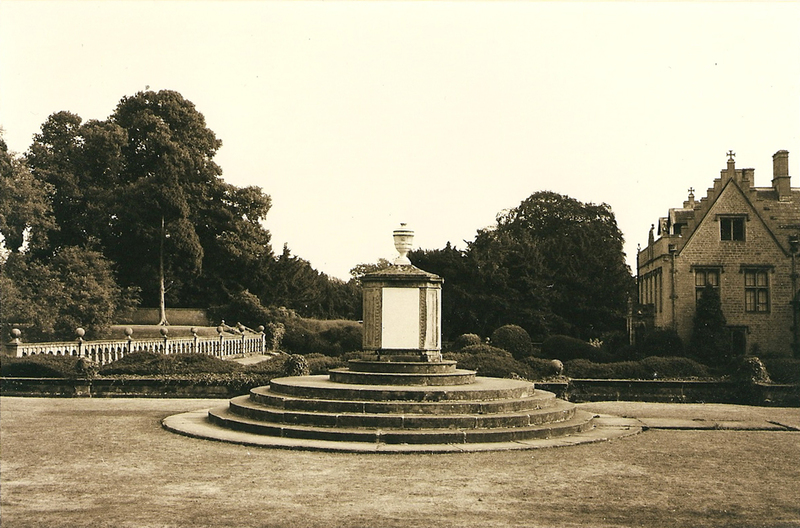 Boatswain was buried on his lordship’s estate at Newstead Abbey. His monument is larger than that of his owner. Regency owners also saw their dogs as an extension of their own personality and their tastes in the exotic. It became particularly fashionable among the ton to own a dog with a background that inspires one to think of faraway places in the Orient. 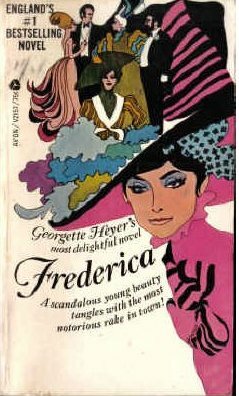 The author Georgette Heyer demonstrated just this very aspect in her delightful Frederica. In this novel, the jaded hero makes an elaborate representation to an irate cowman, two park-rangers and one hatchet-faced lady that the heroine’s family pet, which had caused some riot and rumpus, is actually a rare speciman from Asia. He succeeded in fooling me as well. There is no such thing as a Baluchistan hound. What manner of breed Lufra was is up to conjecture, but the Marquis of Alverstoke demonstrates an insightful perspective into Man’s best friend in the early nineteenth century. 1967 Edition — blame the gay nineties look on Avon! You see, all except for the hatchet-faced lady were only too ready to believe that a nobleman had taken a fancy to owning an exotic dog. In the Regency, anything attached to one’s person that spoke of the Orient gave a fellow distinction. I also was unaware that persons under royal license were allowed to graze cattle in London’s Green Park. That famous Regency denizan Beau Brummel had the distinction of being related to two aunts who held such a license to graze their milch cows in the park. “Oh, dear! So you did. How–how stupid of me!” she replied unsteadily. “I devoutly hope he may be,” returned his lordship dryly. “Well, all I have to say it that it makes it so much the worse!” declared the hatchet-faced lady. “The idea of bringing wild foreign animals into the park! Smuggled, too! I don’t scruple to tell you, my lord, that I very much disapprove of such practices and I have a very good mind to report it to the Customs!…I am speaking of the English Customs, my lord!” she said, glaring at him. This entry was posted in Regency, Uncategorized and tagged Baluchistan, Boatswain, byron, Epitaph for a Dog, Frederica, Georgette Heyer, Newfoundland by Angelyn. Bookmark the permalink. I love Frederika. In the novella I wrote for Nano, I have two Great Danes. Oh! Great Danes are really marvelous. I find them so very expressive. Good characters for any literary form. Thanks for stopping by! Another great blog post from Angelyn about Regency Dogs. You are very kind, Suzi. Your blog quite takes one to a place as interesting and faraway as Baluchistan–Australia! I always thought that the “Baluchistan Hound” was a made-up breed, however there ARE hairy sighthounds that are endemic to that area, related to the Salukis or Aboriginal Afghan Hounds, and known most commonly as Tazi. What is more, the modern “Afghan” was bred in part from dogs imported to Scotland, from Baluchistan in the early 1900s. Of course, that would be too late for Heyer’s novels, but the practice of military officers serving in the Indian army and bringing dogs with them on their return, is not unknown. A bit more speculation, but “Lufra” may well have been modelled on a Lurcher. Lurches being a hybrid of a sight-hound (greyhound or deerhound) and a collie or similar stock-dog. The cross did (and still does) produces a hunting dog that is almost as fast as its hound parent, but with increased intelligence and trainability. A cross between a hairy Scottish deerhound and one of the larger Collies would produce a tall, shaggy dog. …… and yes, I am a bit of a sighthound buff. Dear me, has it been six years? I can scarcely believe it. Peter, I believe you are quite right and there must indeed be a Baluchistan breed. I suppose my error comes from a bit of skepticism voiced by some, including Heyer enthusiasts, that there are certain places and phrases that she made up, and which have no basis in fact. Baluchistan sight-hounds seemed to rank alongside such other fancies as Cheltenham tragedies and making a cake of oneself. I’m glad you commented with this additional research, and especially on the lurcher. Heyer mentions a similar pup in another book–the Reluctant Widow–a lurcher crossed with a mastiff, who must be kept inside for he had the unfortunate habit of hunting on an adjacent property of Sir Matthew Kendal.